In AD 1453, the city of Constantinople, the capital and last stronghold of the Byzantine Empire, fell to the Ottoman Empire. By this time Egypt had been under Muslim control for some seven centuries. Jerusalem had been conquered by the Umayyad Muslims in 638, won back by Rome in 1099 under the First Crusade and then reconquered by Saladin's forces during the Siege of Jerusalem in 1187. It was conquered by the Ottomans in 1517. Orthodoxy, however, was very strong in Russia which had recently acquired an autocephalous status; and thus Moscow called itself the Third Rome, as the cultural heir of Constantinople. Under Ottoman rule, the Greek Orthodox Church acquired power as an autonomous millet. The ecumenical patriarch was the religious and administrative ruler of the entire "Greek Orthodox nation" (Ottoman administrative unit), which encompassed all the Eastern Orthodox subjects of the Empire. 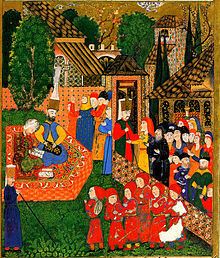 Sultan Mehmed II and the Patriarch Gennadios II. Mehmed II allowed the Ecumenical Patriarchate to remain active after the fall of Constantinople in 1453. Islam not only recognized Jesus as a great prophet, but tolerated Christians to a limited degree. Because Islamic law makes no distinction between nationality and religion, all Christians, regardless of their language or nationality, were considered a single Rum Millet (millet-i Rûm), i.e. Roman millet, or nation. In contrast to Catholicism which was associated with enemy Austria, the Orthodox Church was an accepted institution under the Ottomans, but the number of churches and monasteries was greatly reduced so as to make room for the new mosques being built, and the majority of churches became mosques during Ottoman rule. Only some churches were given maintenance and, even more rare, were new ones built. As such, the Orthodox Church was not extinguished nor was its canonical and hierarchical organization completely destroyed. Its administration continued to function though in lesser degree, no longer being the state religion. One of the first things that Mehmet the Conqueror did was to allow the Church to elect a new patriarch, Gennadius Scholarius. The Hagia Sophia and the Parthenon, which had been Christian churches for nearly a millennium were converted into mosques, yet some other churches, both in Constantinople and elsewhere, remained in Christian hands. Many of these became mosques by the time the 16th century was coming to a close, like the Chora Church, for example. Many churches were also destroyed.They were endowed with civil as well as ecclesiastical power over all Christians in Ottoman territories. The patriarch, as the highest ranking hierarch, was thus invested with civil and religious authority and made ethnarch, head of the entire Christian Orthodox population. Practically, this meant that all Orthodox Churches within Ottoman territory were under the control of Constantinople. Thus, the authority and jurisdictional frontiers of the patriarch were enormously enlarged. The Ecumenical Patriarch was recognized as the highest religious and political leader, ethnarch of all Orthodox subjects. The Serbian Patriarchate of Peć with its seat in Patriarchal Monastery of Peć and the Archbishopric of Ohrid which were autonomous Orthodox Churches under the tutelage of the Ecumenical Patriarch were taken over by the Greek Phanariotes during the 18th century. The Treaty of Kuchuk-Kainarji from 1774, allowed Russia to intervene on the side of Ottoman Eastern Orthodox subjects, and most of the Porte's political tools of pressure became ineffective. At that time the Rum millet had a great deal of power — it set its own laws and collected and distributed its own taxes. The rise of nationalism in Europe under the influence of the French revolution had extended to the Ottoman Empire and the Rum millet became increasingly independent with the establishment of its own schools, churches, hospitals and other facilities. These activities effectively moved the Christian population outside the framework of the Ottoman political system. ^ Europe and the Historical Legacies in the Balkans, Raymond Detrez, Barbara Segaert, Peter Lang, 2008, ISBN 9052013748, p. 36. ^ Studies on Ottoman Social and Political History: Selected Articles and Essays, Kemal H. Karpat, BRILL, 2002, ISBN 9004121013, p. 17. ^ Roudometof, Victor; Robertson, Roland (2001). Nationalism, globalization, and orthodoxy: the social origins of ethnic conflict in the Balkans. Greenwood Publishing Group. pp. 68–71. ISBN 0313319499.